Injinoo (also known as Cowal Creek or Small River) is one of the 5 communities forming the Northern Peninsula Area (NPA). The communities of Umagico (Alau), New Mapoon, Seisia and Bamaga, make up the remainder of the NPA. This area covers a landmass of 1,030km2 in the northern most region of Cape York in far north Queensland. Several groups are believed to have occupied this region prior to first contact. Today, the NPA comprises 5 major groups: Atambaya (Ut-tam-bye-a), Gudang (Good-ung), Yadhaykenu (Yad-ak-ken-u), Ankamuthi (Ang-a-muty), the Wuthathi (Wuth-th-thi) and the Kaurareg People. In an 1896 report to the Queensland Government, Archibald Meston estimated that in the 1870s the Aboriginal population between Newcastle Bay and Cape York consisted of around 800 to 1,000 fighting men. He inferred from this that the total population at this time would have been around 3,000. At the time of writing his report, he believed that the population had fallen to around 300. Meston concluded that the ‘tribe which held the country from Somerset to Cape York (was now) extinct’. The rapid decline of Aboriginal populations in the northern Cape York Peninsula was caused by a number of factors, including introduced disease, exclusions from traditional hunting grounds and frontier violence. During the first few decades of the 1900s, remnants of the Yadheykenu, Wuthathi, Unduyamo and Gudang people from the north and east had established themselves as a single group at Red Island Point. Other Yadhaigana and Wuthathi people formed a group at Injinoo (known then as Small River). Both communities approached the government for land to establish gardens, leading to the creation of an Aboriginal reserve at Cowal Creek in 1915. By 1918, the Cowal Creek Aboriginal community was being praised by government authorities for autonomously forming a functioning, self-sufficient settlement, managed by a self-elected council and community police. The community supported themselves by gardening and working a whaling boat provided by the government, in which they transported oysters, bananas and pumpkins to Thursday Island for sale. After World War I, the Cowal Creek community was severely affected by an influenza epidemic. The population recovered during the 1920s when Alick Whitesand, a Wuthathi man living in Cowal Creek, successfully encouraged many in the communities at Red Island, Seven Rivers and McDonnell to join the Cowal Creek community. At the people’s request, Anglican missionaries and school teachers arrived at Cowal Creek in 1923. During the 1930s, the Anglican Diocese of Carpentaria received government grants for missions including Cowal Creek, and missionary teachers began taking on some administrative functions in the community. From 1936 onwards, the government began to more closely supervise the settlement and reported on Cowal Creek as a ‘government settlement’. However, there is no evidence that the government took full financial responsibility for Cowal Creek or appointed a superintendent. After World War II, populations in this region were again transformed as Torres Strait Islanders began settling in the area. The government initiated development to accommodate this settlement. The government’s policy of encouraging Torres Strait Islanders to move to the NPA was reported to be a compensatory measure for service during World War II, and a measure aimed at populating the north as a defence mechanism against foreign invasion. Throughout 1947, several Saibai Island families established communities at Red Island Point and Muttee Heads. In 1948 however, a storm surge caused Saibai Island to be inundated with sea water forcing the evacuation of many Saibai families to the NPA. To accommodate the Saibai Island people and other Torres Strait Islanders who had decided to move to the NPA, the government created a reserve at Red Island Point in 1948. This reserve was amalgamated with the adjoining Cowal Creek Reserve. After the amalgamation, the reserve consisted of 97,620 acres, populated by around 350 people. Bamaga was developed as the administrative centre of the area. Many people moved to Bamaga during the 1950s, as the government developed the township by erecting accommodation and developing the agricultural and sawmilling industries. By 1978, there were almost twice as many Torres Strait Islander people as Aboriginal people living in the NPA. On 20 March 1985, the Cowal Creek community elected 5 councillors to form the Cowal Creek Aboriginal Council, which was established under the Community Services (Aborigines) Act 1984. The Act conferred local government-type powers and responsibilities upon Aboriginal councils for the first time. Umagico, Seisia, New Mapoon and Bamaga also elected council representatives at this time. On 27 October 1986, the Cowal Creek council area (previously an Aboriginal reserve held by the Queensland Government) was transferred to the trusteeship of the Cowal Creek Aboriginal Council under a Deed of Grant in Trust (DOGIT) lease. The Cowal Creek DOGIT was issued during a time when the community was actively campaigning for acknowledgment of customary tenure over land in the region. In 1984, Daniel Ropeyarn, Chairman of the Cowal Creek Community Council, announced that the community wished to ‘resume responsibility over our traditional lands’ and called for a combined Aboriginal council as a joint local authority with local government functions for the Aboriginal communities at Cowal Creek, New Mapoon and Umagico. This did not occur. The Cowal Creek community formally changed its name to Injinoo in 1988. On 1 January 2005, the Injinoo Aboriginal Council became the Injinoo Aboriginal Shire Council. The Local Government (Community Government Areas) Act 2004 prescribed a transition to compliance with the Local Government Act 1993 over a 4-year period. In 2007, the Local Government Reform Commission recommended that the 3 NPA Aboriginal councils and the 2 NPA Torres Strait Islander councils be abolished and that a Northern Peninsula Area Regional Council (NPARC) be established in their place. This occurred on 15 March 2008, when the first NPARC was elected under the Local Government Act 1993. N Sharp, Footprints Along the Cape York Sandbeaches (Aboriginal Studies Press, Canberra, 1992) 3, 85. Ankamuthi People: Native Title Tribunal file no: QC99/26. Wuthathi, Kuuku Y’au and Northern Kaanju Peoples: Native Title Tribunal file no: QC02/26. Wuthathi People #2: Native Title Tribunal file no: QC02/25. Gudang Yadhaykenu People: Native Title Tribunal file no: QC08/8. The Northern Cape York Group #1: Native Title Tribunal file no: QC11/2. Kaurareg People #3: Native Title Tribunal file no: QC10/3. Archibald Meston, Report on the Aboriginals of Queensland to the Home Secretary, QLD, Votes and Proceedings, vol.4, 1(1896) 724; Queensland State Archives, Home Secretary’s Office, HOM/J717, 1929/3999, list of Aboriginal reserves. For further information see Sharp, above n 1, 55-58; J Richards, The Secret War: A True History of Queensland’s Native Police (Queensland University Press, St Lucia; 2008) 42. Sharp, above n 1, 85. Sharp, above n 1, 85-87. Queensland State Archives, Home Secretary’s Office, HOM/J129, 1914/9001, Report of the Chief Protector of Aboriginals on Annual Inspection of Northern Institutions, 1915). See also Queensland, Queensland Government Gazette, 23 October 1915, 1374. Sharp, above n 1, 87-88. Richards, above n 9, 95; Queensland, Report on the Operations of the Sub Departments of the Home Secretary’s Office, for the year ending 1920 (1921) 9; Queensland, Report on the Operations of the Sub Departments of the Home Secretary’s Office, for the year ending 1918 (1919) 10; Queensland Parliamentary Papers, 1926, 11. Queensland, Report on the Operations of the Sub Departments of the Home Secretary’s Office, for the year ending 1920 (1921) 7. Sharp, above n 1, 85-87. However, an unpublished PhD thesis by Dr Susan McIntyre-Tamwoy suggests that the move of people to join the Cowal Creek community was not voluntary. Dr McIntyre-Tamwoy describes an account told by McDonnell River people where Alick Whitesand, a Wuthathi man, accompanied by armed police, forced the people to move together to Cowal Creek. Canon John Done, Supervisor of the Anglican Mission for the Diocese of Carpentaria, began visiting the community after the First World War. For information, see J J Done, Wings Across the Sea (Boolarong Press, Brisbane, 1987). The mission was initially financed by voluntary contributions from churches in the Torres Strait. A teacher named Satraika from Mabuiag was appointed to the school. Later, Islander teachers from Badu named the Reverend Francis Bowie and Jomen Tamwoy came to the community. Richards, above n 9, 90, 95. Queensland State Archives, Home Secretary’s Office, HOM/J795 1930/8365, letter from the Registrar at The Vicarage, Thursday Island acknowledging receipt of a grant of £373.49 to the Diocese of Carpentaria. Queensland, Report on the Operations of the Sub Departments of the Home Secretary’s Office, for the year ending 1936, 13; Queensland, Report on the Operations of the Sub Departments of the Home Secretary’s Office for the year ending 1937, Government Settlement Cowal Creek, 14; Queensland, Report on the Operations of the Sub Departments of the Home Secretary’s Office for the year ending 1938, Government Settlement Cowal Creek, 13. Sharp, above n 1, 93. Queensland State Archives, Director of Native Affairs Office, SRS 505/1, 9M/10, part 1, Administration Cape York Peninsula, Development of NPA, corr.4.10.1948. Queensland, Report of the Director of Native Affairs for the Twelve Months ended 30 June 1948 (1949), 2. Ibid, 22; D Ober, J Sproats & R Mitchell, Saibai to Bamaga, The Migration from Saibai to Bamaga on the Cape York Peninsula (Joe Sproats and Associates, Australia, 2000). Queensland, Annual Report for the Department of Native Affairs for the year ending June 1952 (1953) 26; Queensland Government Gazette, 24 July 1948, 675; SRS 505/1, Administration Cape York Peninsula, Development of Northern Peninsula Area, File 9M/10 (1), corr.4.10.1948. Queensland, Report of the Director of Native Affairs for the Twelve Months ended June 1952 (1953), 26. Queensland, Report of the Director of Native Affairs for the Twelve Months ended 30 June 1952 (1952), 26; Queensland, Report of the Director of Native Affairs for the Twelve Months ended 30 June 1953 (1954), 30-31; Queensland, Report of Director of Native Affairs for the Twelve Months ended 30 June 1954 (1955), 29-30. Sharp, above n 1, 96. Queensland, Annual Report of the Department of Community Services for 1986 (1987) 2. For information regarding granting of DOGIT lease to Cowal Creek, comprised of 79,542 hectares, and dates for DOGIT transfers to all community in trust areas, see Queensland, Annual Report of the Department of Community Services for 1987 (1988) 29. Injinoo DOGIT is defined in NPA Infrastructure ILUA as comprising Lot 7 on Survey Plan 104552, County of Somerset, Parish of Seymour and Lot 7 on Survey Plan 120089, County of Somerset, Parish of Cowal and Lot 103 on Survey Plan 120089, County of Somerset, Parish of Cowal. Injinoo Council to Minister for Northern Development, 28 September 1984, Council Office, in Sharp, above n 1, 139. Sharp, above n 1, 139-141. 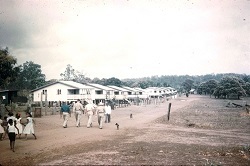 Injinoo (formerly Cowal Creek) circa 1959-60.